free breakfast buffet with at least one or two hot entries open 6-10am. free high speed Internet access. If you don't have a computer, there's free access PC in the business center. We had the king size suite so we had two TV's, king size bed in one room, sofa in the other, which is handy if you're traveling with kids and want to get some work done. Staff was friendly and efficient. This was our third stay at this hotel. The only non-family friendly problem was that a number of nearby eateries don't allow kids, since city has regs prohibiting kids in places which allow smoking. Air assist toilet was noisy. Overall a nice hotel in a great spot downtown. Staff was friendly, the breakfast and coffee were good and the bed was really comfortable compared to some other hotels I have stayed in. The hotel was conveniently located and our room was very clean. The room was smaller than we expected, but we didn't really mind. The Hampton Inn Downtown Indianapolis, Indiana is located in the heart of Indianapolis. It's in the historic Chesapeake building which is across the street from the Circle Center Mall and near the Indianapolis Convention Center, Lucas Oil Stadium, Conseco Fieldhouse and several of Downtowns favorite restaurants. The Circle Centre has more than 100 shopping, dining and entertainment selections. This hotel is also right next to the city's 7.5-mile trail connecting the cultural and historical sites. The five districts connected by the trail include Fountain Square, Indiana Avenue, Mass Avenue, The Canal & White River State Park and our location, the Wholesale District. Your children will love the Children's Museum of Indianapolis with 11 galleries and 400,000 square feet of space. Restaurants in the area include the Old Spaghetti Factory, Hard Rock Cafe and St. Elmo Steak House. Ask the friendly staff if you have any questions. The Hampton Inn in Downtown Indianapolis, Indiana has 180 guest rooms with many amenities such as coffee makers, irons, ironing boards and hairdryers. Bathroom amenities include night lights and curved shower rods. Enjoy a wonderful movie on cable or premium television. Relax as you listen to soothing music on the easy to set alarm clock radio. You have a choice of king and queen size beds in smoking and non-smoking rooms. Accessible rooms are available for those with disabilities. 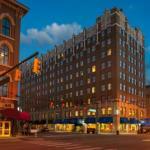 The Hampton Inn in Downtown Indianapolis, Indiana is great for business and pleasure travelers. Enjoy a complimentary breakfast in a nice breakfast area. Coffee, tea and hot chocolate is served throughout the day. You can exercise in the equipped fitness room. Business travelers have the convenience of the business center, meetings rooms, printer, fax, audio/visual equipment rental and more. The laundry/valet service and coin laundry is great if you need clean clothes. Room service is available if you need anything. Theres also a newsstand at this hotel. There are elevators so you don't need to walk up the stairs.